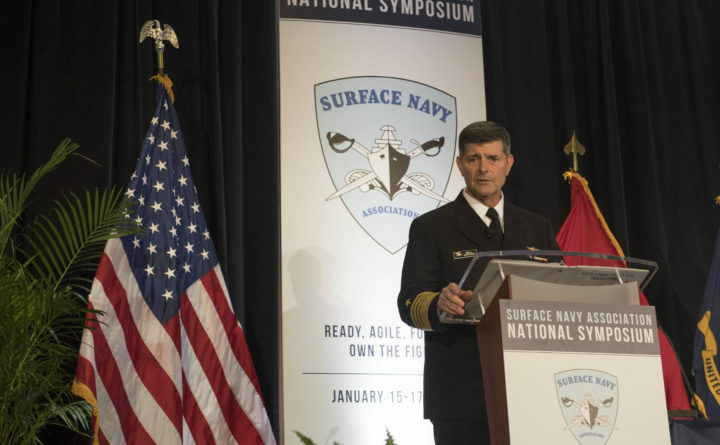 Adm. Bill Moran delivers the keynote address at the Surface Naval Association’s 31st National Symposium, Jan. 15, 2019. Adm. William Francis Moran, President Donald J. Trump’s nominee to serve as the 32nd chief of naval operations, spent an early tour of duty at the former Brunswick Naval Air Station, serving in Patrol Squadron 44. Trump nominated Moran, currently vice chief of naval operations, to replace Adm. John Richardson, on Thursday, according to the Office of the Navy Chief of Information. Moran flew P-3 Orion anti-submarine patrol planes and served with VP-44 at Brunswick Naval Air Station from June 1983 to April 1986 as an instructor pilot, educational service officer, power plants branch officer and pilot training officer. He later commanded VP-46 and Patrol Reconnaissance Wing Two in Hawaii, as well as on the staff of Carrier Group 6 aboard the USS Forrestal. From 2013 to 2016, Moran served as the chief of naval personnel in Arlington, Virginia. “As I turn over and go ashore, I will rest easy knowing that, pending confirmation, Adm. Moran has the watch,” Richardson said.